It is a common fact that most people would prefer to die instead of giving a public speech. In fact, public speaking phobia is rated as the largest single fear above the fear of spiders AND the fear of death. It doesn’t have to be this way for you however. 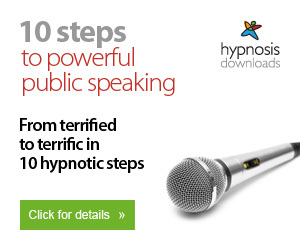 I Am Totally Petrified Of Giving A Speech, Can Hypnosis HELP? Getting the jitters when having to speak in public is common, even the most experienced actors frequently are nervous on opening night, for example. However, some people are actually totally paralyzed at the very thought of having to perform any kind of public speaking. That is when hypnosis can be most helpful, so yes, of course hypnotism can help! Have you ever heard the term “he was the cynosure of all eyes in the room?” That means that he had the attention of everyone in the room, they were all staring at him. In effect, it could also mean that they were judging him too. Those who absolutely cannot speak in public fear rejection, they fear being made fun of, and of course they fear a faux pas of some sort. Some have such tremendous fear of public speaking that they exhibit the “fight or flight” signs of anxiety. Also there is always a degree of uncertainty involved in public speaking, and the mind can build that uncertainty into total fear of an eminent catastrophe. So what will a hypnotherapist do for me? You will of course lose the sweating, the jitters, the trembling hands, and even more important, you will no longer have sweaty palms, and your heart rate will return to a more normal rate, and best yet those darn butterflies will have flown away. A hypnotherapist will work with you to give you a brand new level of assurance and calmness. Fine, how does it work? When we go through hypnosis to cure public speaking phobias we often find that the phobia began when something happened to us that marked speaking out in public as something that could be extremely painful. The subconscious mind will always make us avoid that which we have learned is painful; it does that for self-preservation. Strong affirmations will overcome your public speech anxiety phobia as you begin to believe that you are a powerful speaker, that people find you inspiring and yearn to hear you speak, and finally that you are articulate and very confident when speaking. What do I need to do now then? If you are serious about wishing to be able to speak in public without fears, what you need to do is to fill in the form below and tell us how long this fear has held you back and at what cost to your career. Our most suitable professional hypnotherapist will contact you shortly and discuss how we can assist you with hypnotherapy to break free of the fear of public speaking easily. You will be so glad you did when you make your first speech with total confidence and “in zone”.